For centuries Maarjamae has been a favorite holiday spot in the Tallinn area. From the 17th century there has been a summer estate here, then known under the name Strietberg. In 1811, the estate was bought by merchant J. G. Clementz, who built a sugar factory here (operated until 1837) and the place acquired the common name Sugar Hill. Several stone houses and outer wall exist today. The new owner Chistian Rotermann converted the factory to a distillery in 1860. Several stone houses and outer wall exist today. In spite of the industrial presence, the area saw continued use as a recreational area, by the 19th century Tallinn was known as a seaside town. In 1820, the Russian writer Nikolai Karamzin held salon discussions here, and literati and other celebrities frequented the area. In 1873, the property was bought by St.Petersburg Count Anatoli Orlov-Davydov. The place began to be called Marienberg or Maarjamae,likely in honour of the countess or daughter (both were Marias). The castle was built on the site of the factory in 1874 under the hand of architect Robert Godicke with an attractive stair leading to the sea. Gradually a manor-style park with an open design took shape. In the 1920s after Orlov-Davydov emigrated to France, the buildings were leased out as a vacation site. In 1937, the Estonian government bought the place and a flight school was established here. The military institution changed the appearance of Maarjamae, and most buildings were converted. In 1940, the Red Army took Maarjamae. 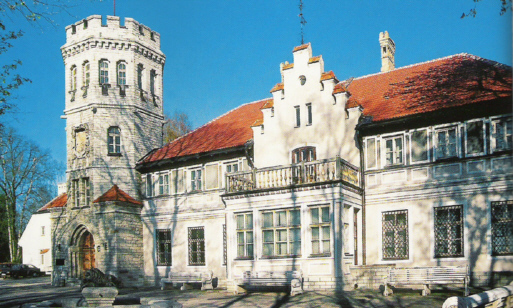 In 1975, the buildings were leased to the Estonian History Museum. Special attention was paid to the facades during restoration, the park renovation followed a 1910 plan. In 1987, Maarjamae opened an exhibition recent history (from the 19th century on) and large travelling exhibits also appear. A monument to Soviet soldiers has stood here since 1975, a 35-meter obelisk dedicated to the 1918 retreat of the Red Fleet to Kronenberg through two feet of ice.